All user configurable settings can be accessed via Command Line Interface (CLI) or via the AQ ECU. 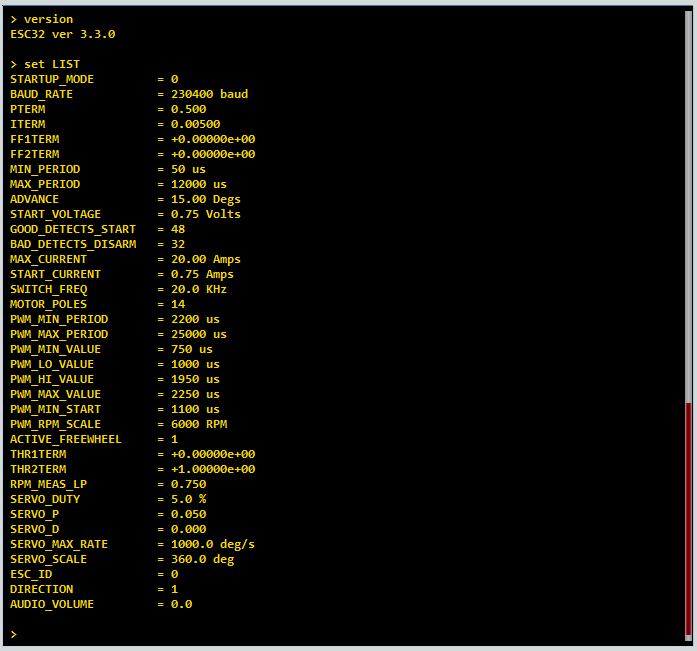 To access the CLI, connect the ESC to the AQ ECU (you can also use Putty or other similar terminal clients) via USB or UART with the following settings: 230400 Baud, 8 bits, no parity, 1 stop bit. The below table is an overview of each available setting, their default values and explanation of how they work. WARNING: Do not change a parameter, unless you are sure how it works and how it will affect the ESCs operation. Incorrect settings can lead to motor or ESC damage. PTERM 0.500 The PI controller governs the speed at which duty or RPM changes are applied. ITERM 0.00500 The PI controller governs the speed at which duty or RPM changes are applied. FF1TERM +0.00000e+00 The Feed Forward terms govern the Closed loop RPM controller. The terms describe a curve that expresses the Motor RPM as a function of voltage. FF2TERM +0.00000e+00 The Feed forward terms are generated for a specific motor and propellor by running the RPM to Voltage calibration. ADVANCE 15.00 Degs The timing advance in electrical degrees. There are 60 electrical degrees in one commutation cycle. Between 0 and 30 degrees. BAD_DETECTS_DISARM 32 Number of zero crossings missed before the motor is disarmed. PWM_LO_VALUE 1000 us The input PWM pulse length in microseconds for the lowest throttle setting. PWM_HI_VALUE 1950 us The input PWM pulse length in microseconds for the highest throttle setting. PWM_MIN_START 1100 us The input PWM pulse length in microseconds at which the motor will be started. Once running, the throttle can be brought as low as PWM_MIN_VALUE as long as the motor does not stall. PWM_RPM_SCALE 6000 RPM Closed Loop RPM Only. In closed loop mode, this term scales the input signal to RPM. Low throttle is 0 zero RPM and High throttle is 6000 RPM with the default value. THR2TERM +1.00000e+00 Closed Loop thrust mode only! Closed loop thrust mode scale terms. RPM_MEAS_LP 0.750 Low pass filtering constant for the RPM measurement. SERVO_DUTY 5.0 % Servo mode only. Only for use with high resistance gimbal motors.Servo duty (power) Between 0 and 100 percent. Be careful and watch for overheating. AUDIO_VOLUME 0.0 Audio volume. Between 0.0 and 5.0 – Be careful, using the motors as speakers creates a lot of spikes in the supply and uses a lot of power – especially on bigger motors. Keep it down! Note 2: Min and maximum frame rate is calculated by this formula: 1000000 / PWM_MIN_PERIOD. This page was created on 4-Aug-15 by jussi. Last modified on 21-Aug-15 by kinderkram.